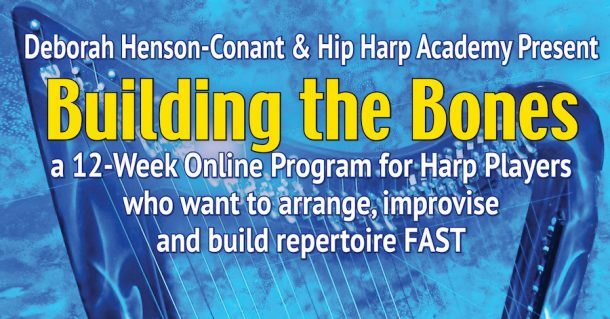 “Hip Harp Academy” is a multi-level online creative learning school for harp players that was created by Deborah Henson-Conant. Below is an image of the dashboard at Hip Harp Academy. This is what you’ll see once you log in. The red icons show the classes you have access to as a FREE Level member. The black badges show what you”ll get as you upgrade to the higher levels. HARNESS YOUR MUSE – which is a year-long application-only mentorship and mastermind group. Get more info and apply here at HarnessYourMuse.com. 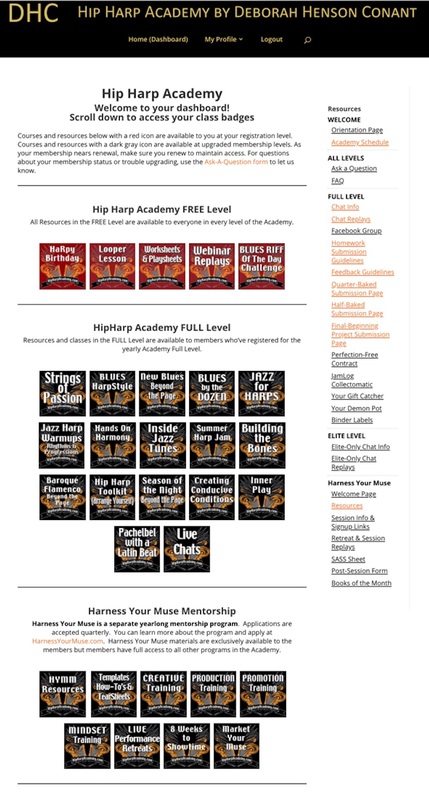 To access the higher-level courses – including the courses I personally guide with weekly live chats – you can upgrade at any time after becoming a FREE member — OR you can simply register for the “Hip Harp Academy Full/Core” Level at the Info & Registration page. “Harness Your Muse” is my year-long mentored mastermind program. This program includes a the highest level of coaching and mentorship you can get in my programs, with bi-weekly group focus sessions, two in-person retreats, monthly project-completion goals and a private Facebook Community with the other members of the mastermind. This is a project-completion program. It’s not based on your technical ability, but on your intention to commit yourself to your dream project. Some people enter with a very clear view of their project, others enter with a strong sense of their project and we work to clarify that sense and then create the steps to achieve it. You can apply any time, but members enter quarterly if there’s space in the program. You can get more info and apply now below. If you’re interested but not sure if this program is right for you, fill out the application anyway (the application itself will give you some clarity) and include your questions about whether it’s right for you. I look forward to seeing you in the Academy!